Browsing the next page of Asian Recipes. Recipe for Thai Shrimp Skewers from our Appetizer recipe section. Recipe for Kung Pao Shrimp from our Main Course recipe section. Recipe for Chinese Steamed Clams from our Appetizer recipe section. Recipe for Garden Vegetable and Tempeh Saute from our Main Course recipe section. Recipe for Thai Chicken with Basil from our Main Dish recipe section. Recipe for Teriyaki Salmon Salad from our recipe section. Recipe for Crunchy Chicken Stir-Fry Salad from our Salad recipe section. 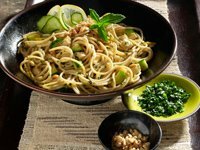 Recipe for Soba Noodle Salad from our Salad recipe section. Recipe for Teriyaki Sesame Vegetables from our Main Course recipe section. If Thai chiles are unavailable, seeded jalapeno chiles can be substituted. Recipe for Spaghetti Oriental from our recipe section. Recipe for Asparagus with Peanut Sauce from our Side Dishes recipe section. Thai peppers are tiny, spicy and full of flavor. If you would like to bring down the heat a bit in this dish omit a portion of the peppers. If you like it spicy, two of these firecrackers are quite a kick. 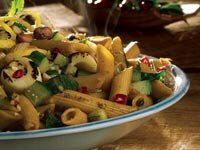 Recipe for Penne all’Oriental from our Main Courses recipe section. Contains 1g saturated fat and 1g dietary fiber. Recipe for Fish with Chinese Ginger Scallion Sauce from our Main Courses recipe section.